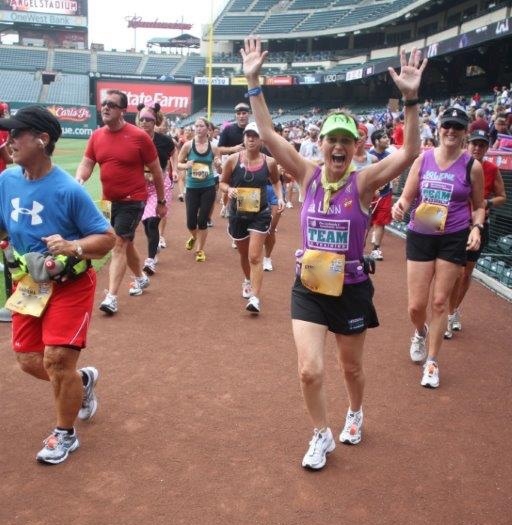 As I was looking over the races I have done, I noticed I have run through several iconic stadiums and tracks, places where famous races and sporting events are held. It is one of the more enjoyable aspects of running races – I get to go places I would otherwise never see. This past weekend I ran the Green Bay Half Marathon where I ran around the inside of Lambeau Field. I am not a big football fan but I have to admit Lambeau Field is impressive. The stadium is the oldest continually operating NFL stadium. 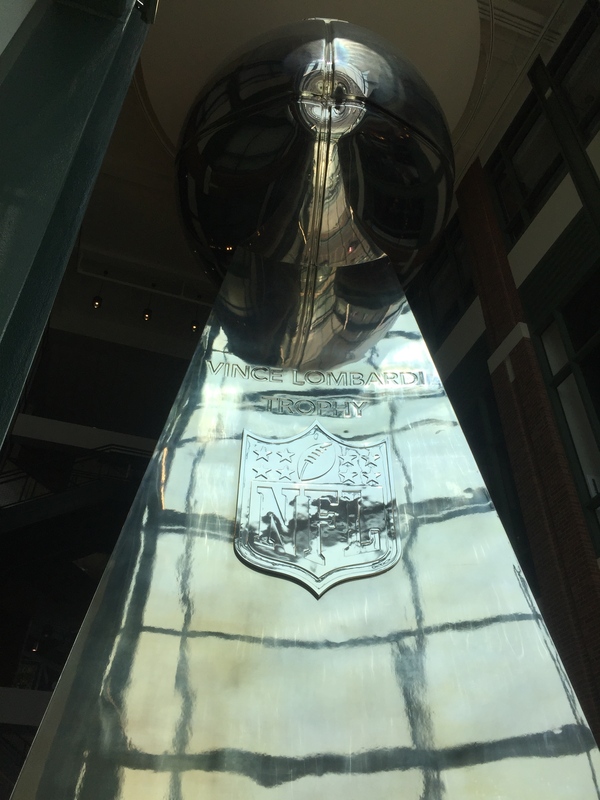 Inside the stadium, there is a 50-foot tall chrome replica of the Lombardi Trophy. Weighing 14.5 tons, it is reported to be the largest object ever covered in chrome. No kidding. Just like the trophy, the stadium is huge with seating capacity for over 81,000 people. The only thing bigger in Green Bay is the residents’ enthusiasm for their home football team, the Green Bay Packers. I can’t describe it. It is something you need to go to Green Bay and see for yourself. 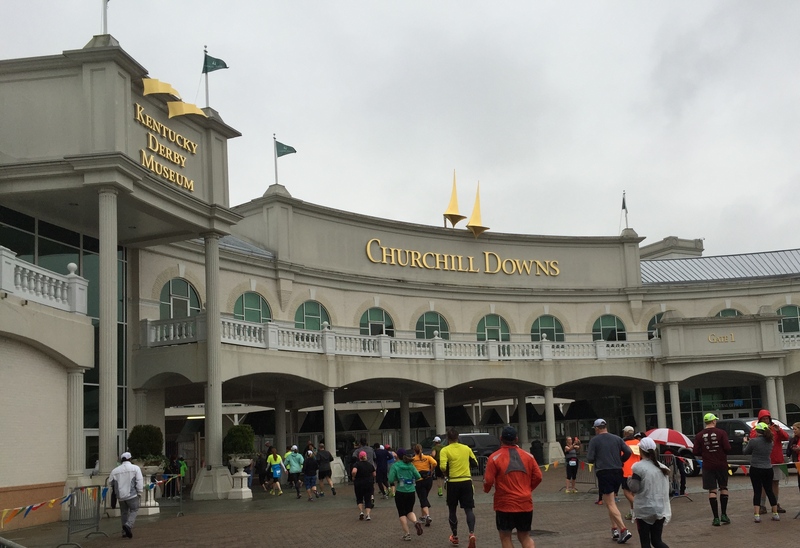 In 2015 I ran the Kentucky Derby Festival Mini-Marathon where we ran a lap on the infield at Churchill Downs. The marathon was a couple of weeks before the Kentucky Derby. While we were running on the infield, there were horses out exercising on the track. I am not sure if American Pharaoh was among them but it is exciting to think that the future Triple Crown winner was running there too. In Berlin I ran the Breakfast Run, a free 6K run the day before the marathon that helped tame pre-race jitters. The race started at Charlottenburg Palace and ended on the track at the Olympic Stadium, site of the 1936 Summer Olympics. 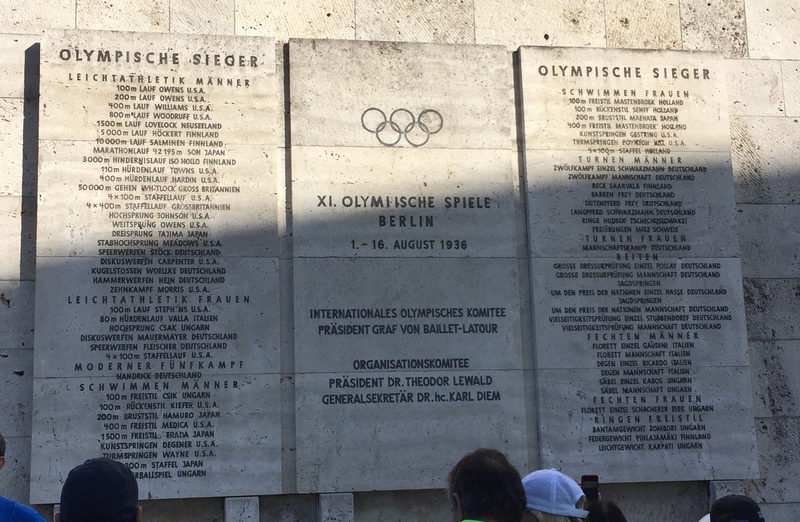 Etched into the wall was a list of the winners of those Games, most famously Jesse Owens who won four gold medals. Lots of history there. 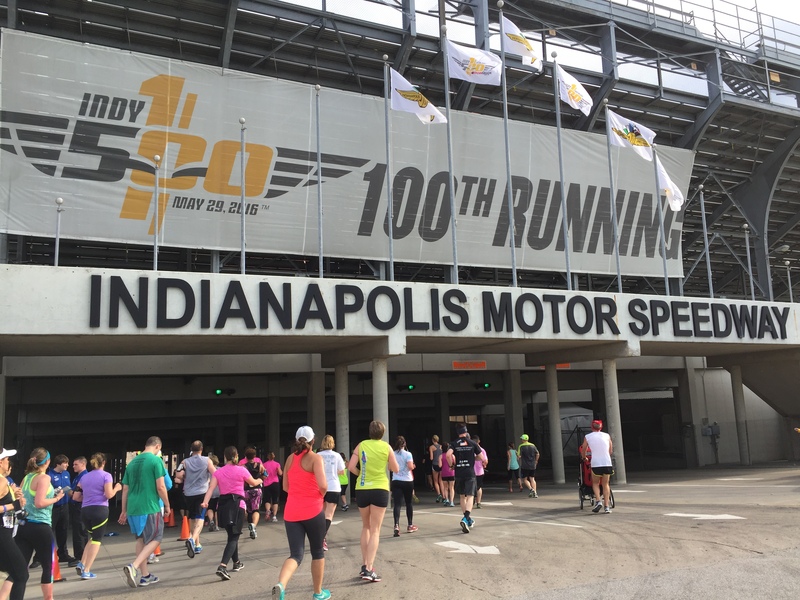 Just a few weeks ago, I ran around the Indianapolis Motor Speedway, home of the Indianapolis 500. The speedway is by far the largest venue I have ever seen with seating for 250,000 – 300,000 people. Thankfully we did not run on the banked part of the track – that would have been painful. I ran one lap around the track – 2.5 miles. Race car drivers have to complete 200 laps in the Indy 500. So far I have run on a professional baseball field, a horse racing track, a historic Olympic Stadium, an auto racing track, and a professional football field. I don’t know of any races that go through professional basketball courts, tennis courts, or golf courses. 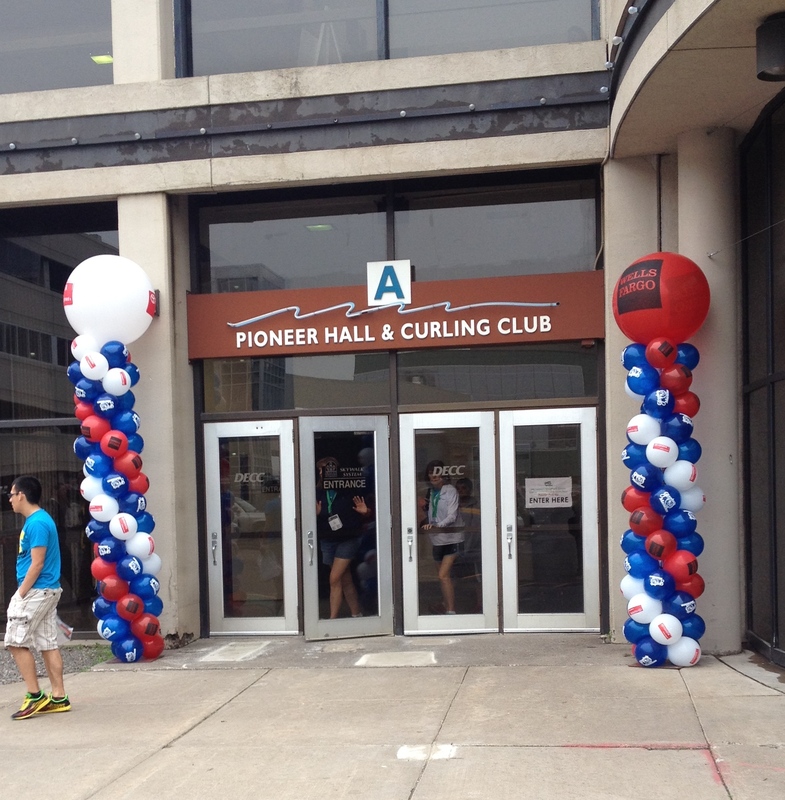 I can guarantee there aren’t races on hockey rinks, though I do recall that the Expo for Grandma’s Marathon was held in Pioneer Hall and Curling Club at the Duluth Entertainment Convention Center. Next year I plan to run the Eugene Half Marathon in Oregon. The half marathon course ends in probably the most iconic track and field stadium in the US, Hayward Field at the University of Oregon. Some of the legendary runners who have competed on that field include Alberto Salazar and Steve Prefontaine (also known as simply “Pre”). Bill Bowerman was a long time track and field coach at the University of Oregon. Bowerman became well known for making running shoes for members of the University of Oregon track team using his wife’s waffle iron. He later co-founded Nike with Phil Knight. Running on Hayward Field will be the perfect way to round out my races through iconic sports stadiums and tracks.